Despite my love of cooking and experimenting in the kitchen, I can be quite a lazy cook. 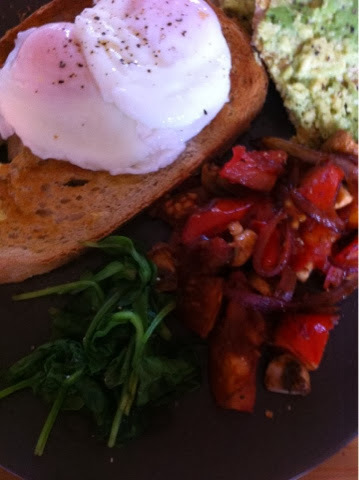 Poached eggs and spinach with tomatoes, onion and mushrooms cooked in a dash of balsamic. The poached eggs and steamed spinach are extremely good for you, as are the vegetables, although cooked in a little oil and balsamic for that naughty treat. I've also fallen in foodie love with sourdough rye bread, spread with avocado and a dash of lemon juice. All perfect for any time of day. Who said lazy cooking had to be boring?